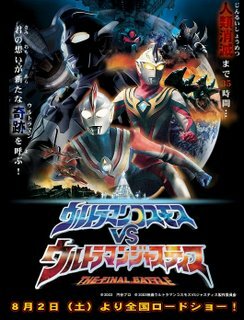 Over the years, the Japanese Ultraman series have veered between two extremes - from the hardnosed gritty action where characters even die in Ultraman Nexus, to the childish acting and cute monsters of Ultraman Cosmos. As always, every episode, Japan gets threatened by a giant monster.and in this series it's the EYES team that fly to the rescue from their special island base. They usually stall the monster long enough until Ultraman sorts it all out. Unbeknownst to the members of EYES, one of their young pilots, Musashi, is actually a living host to Ultraman - whenever there's danger, he can transform into the giant alien defender for a few minutes in order to save the day. There's a flimsy narrative that runs through the series about an outer space force that 'possesses' otherwise peace-loving (giant) monsters. It's not like the complex story arc of Ultraman Nexus. Neither is it adult, violent or creepy like Nexus, which was my previous favourite series. Cosmos is a real slog to get through, and is really only for the very young. Many of the monsters are too cute, and the EYES team are dedicated more to conservation rather than obliteration. This means less fighting and more silliness. The EYES Task Force are all adults, but they act like they're in a classroom. The idea that this crowd could be entrusted to save the world is constantly ridiculous. The likeable cast are made to act like naughty schoolchildren. They rarely get a chance for any serious acting or even subtle comedy. Fubuki looks the most convincing as a pilot, rather than the rather wet lead, Musashi. The FX are fun, the monster suits are excellently made, better so than Ultraman's, which are more creasy and ill-fitting than usual. The climactic fights are slowly staged and constantly fall back on poor video tricks. Also the emphasis is on defensive fighting - Ultraman tries to push opponents away rather than harming them, it's honourably pacifistic, but limits his variety of moves. Admittedly the very first Ultraman in 1966 was aimed squarely at the whole family, even having a young boy help out Earth's anti-monster task force. But the extended run of Cosmos (at 64 episodes) has been a hard slog to get through. I watched the whole thing to see if the tone changed at all. There's a couple of stand-out episodes, but they're pretty rare. Towards the end of the series, many monster suits from the series are re-used - it's rare in Ultraman for this to happen, usually a brand new foe arrives every episode. This lack of ideas or new monsters makes the series look like its run was extended late in the day. 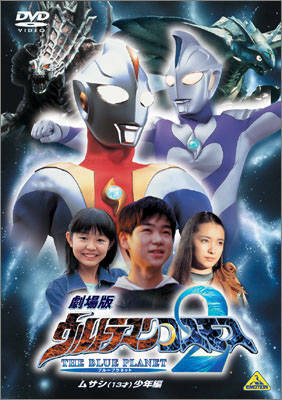 If you really want it, the entire series is available from Hong Kong on 8 DVD volumes that contain between 4 and 8 episodes each (an example of the cover art is shown above). The English subtitles are sometimes pretty vague but help you follow the action. There are also behind-the-scenes clips from each episode as DVD extras. You can also get the series from Japan but without English subtitles. On the other hand, the series spawned 3 feature films which were the best of their kind, until Ultraman Next was released. I'd recommend any Ultra-fans out there to give the Cosmos series a miss and check out the movies instead. They were all out on subtitled DVDs from Hong Kong. First Contact sets up the Ultraman Cosmos series by showing us how Mushashi, as a young boy, becomes Ultraman. The effects are OK (apart from the opening fight in space between CGI characters), including a startling transparent Ultraman. Once again, it's the monster Baltan who's the main foe - Baltan was the very first adversary for Ultraman in the first episode of the 1966 series. 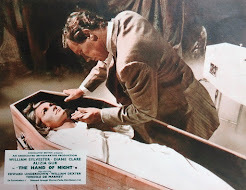 The monster-friendly theme of the TV series is established in the film in a scene where the EYES team try to fend off a giant monster by punching it gently on the nose (with giant boxing gloves that have inflated out of their Thunder vehicles)! Similarly silly is an attempt to sing Baltan a lullaby (out of huge speakers that have sprouted from their planes) and send him to sleep. Also, there's a lot of kids charging about in this one, a stereotyped grandad/inventor and a flying toy robot. The other 2 movies are more action-packed, with solid effects and imaginative storylines, which are far more enjoyable for older audiences. In Blue Planet, there'a whole undersea race of humanoid aliens and some marvellously realised CGI alien 'whales'. The island locations (in Southern Japan) release the characters from the small, claustrophobic sets of the TV series. This film takes place after the series timeline has ended, but also doubles as a direct sequel to the first film. But you don't have to see the series to understand the films. 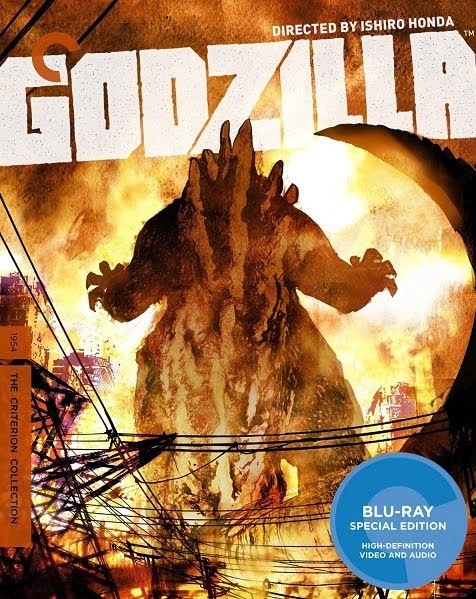 The ambitious storyline packs in UFOs, worldwide destruction, and a fleet of marauding giant monsters that look like a cross between Meganeuron (from the Godzilla film) and Legion (from Gamera 2). The monster suits are awesome-looking, and there's many action-scenes with plenty of large-scale model work. Some cast members and characters appear from the Ultraman Tiga series, and there's even a special guest Ultraman late in the action. 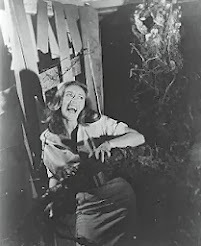 The DVD cover (above) is from the region 3 Hong Kong release. I'm not sure who the kids are on the front cover though - they seem to have strayed in from the first film and don't appear in the second - it's an all adult cast. The widescreen picture is letterbox and not anamorphic. The english subtitles are generally OK. There are trailers and TV spots as extras, as well as some behind the scenes footage and an extra scene (but these are not subtitled). Finally, this third part of the movie trilogy keeps on referencing the previous two movies, virtually recalling everyone in the casts for a reunion. Our soppy hero, Musashi, is about to transplant some of his favourite creatures from Monster Island to a new life on other planets. He is thwarted on the launch pad by an unseen bunch of aggressive aliens and their giant robots - the awesomely designed 'Glokers'. Shock horror, Ultraman Justice (who briefly appeared in Blue Planet) is fighting on their side! After a catastrophic defeat, can Earth summon a defence against the alien fleet of spaceships, an army of heavily armed robots and a mother of a mothership! The human counterpart of Ultraman Justice is revealed to be a woman, played by Kazue Fukiishi who, dressed in black leather and heavy eye shadow, looks like a living prototype for Lil Mayer, the lead character in Ergo Proxy. She gets all the best dramatic scenes and a great gravity-defying fight at the foot of Tokyo's Rainbow Bridge. The action here is non-stop, Tokyo takes a heavy beating, and there's a tremendous outer space finale. The traditional large-scale miniatures and monster suits are aided by flawless compositing and some subtle CGI FX. The script's repetitive and preachy 'love conquers all' messages running throughout the film make it not as good as Blue Planet, but just as short (about 76 minutes). 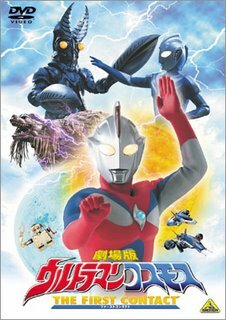 But the pros outweigh the cons, making this an Ultraman movie that I keep on revisiting. The region 3 Hong Kong DVD again has a letterbox picture but not anamorphic. The english subtitles are generally OK. There are trailers and TV spots as extras, as well as a little behind-the-scenes footage. 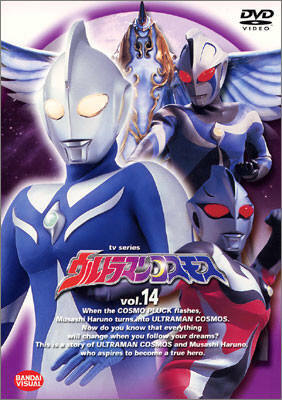 I love Ultraman Cosmos, he was more peaceful compared to the other Ultras.